You can see we’ve put in a number of links to different pages and you may recall that we have contact forms on every page of the website. So we’re hoping this will capture information from everyone visiting the page who wants to know more. I like Google pages, but I am a bit confused about the difference between Google Plus and Google My Business. This is definitely a business page but you can find it by searching on Google+. Go figure …. Looking at the screen shot above, I realise that the photo at the top doesn’t tie in with our Facebook page and the website so we may have to change it. There’s nothing we can do about the red because that’s Google’s new format. There’s still an old format to view, but I’m sure they’ll gradually switch to the new one. So we’ve been pretty comprehensive with our Google page (I’ll call it that since I’m not exactly sure what it is!). We’ve done a good long description with a list of services, some of which are linked to pages on the website. We want to make it easy for people to visit the site and leave their data! We also uploaded a lot of good photos to the site – mostly those already on the website. We figured that people want as much information as possible if they’re to start trusting us. The internet isn’t the most personal approach, but it’s the way millions (billions) of people are finding goods and services these days so we reckon you have to try to build some sort of relationship and trust through these online pages and the website. 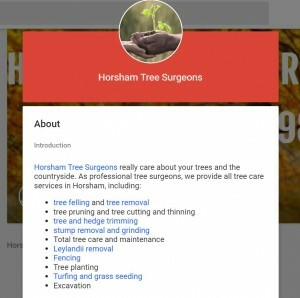 We asked customers of Horsham Tree Surgeons to leave them a review and we have 6 to date. That’s pretty good as many companies don’t have any reviews at all and tree surgeons aren’t like restaurants where everyone wants to have their say. So we’re pretty pleased with the Google page and it’s another step towards dominating the tree surgery world in the area of data collection. All things point to HTS’s contact forms or phone number. Speaking of phone numbers, we have that covered too. When someone calls in to the company, their details are taken and immediately entered into the CRM. Really it’s up to them to say they don’t want to have emails or give their email address. If they give it, then they’re fair game! Remember every email that goes out has an opt-out link at the bottom so they only need to receive one if they really don’t want more information.